Northwest corner of the tower from 5th Avenue. 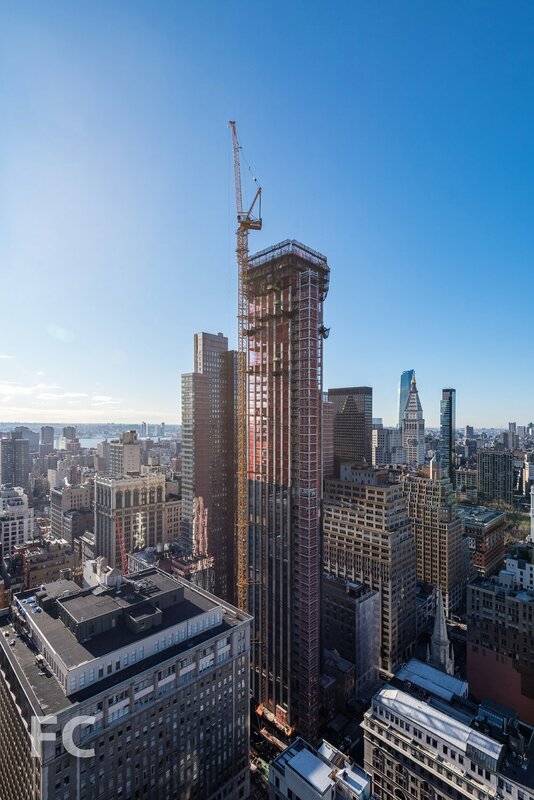 Superstructure has officially topped out at 277 Fifth Avenue, a 55-story residential tower from developers Victor Group and Lend Lease. 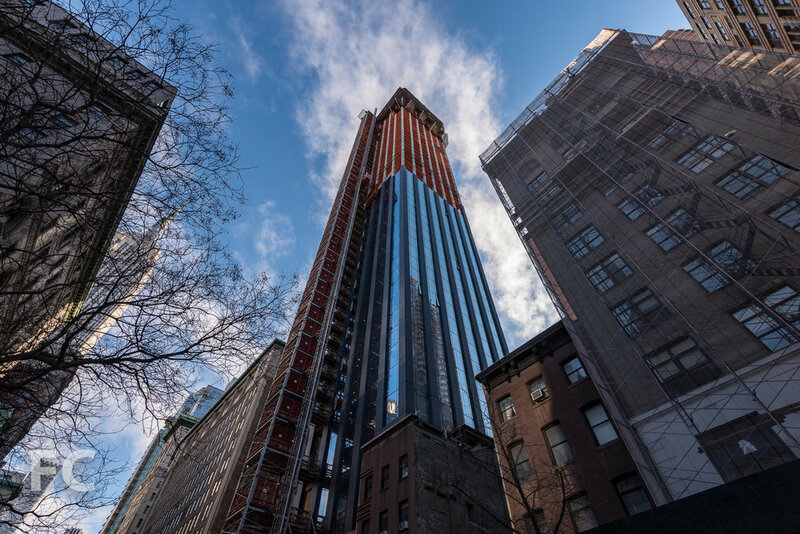 Located in the NoMad neighborhood, the tower will offer 130 residences ranging from one to four bedrooms, with interiors designed by Jeffrey Beers International. Northwest corner from 5th Avenue. Designed by Rafael Vinoly, the tower's exterior facade features a vertical striped pattern of hybrid glass curtain wall and high-performance lightweight reinforced cast concrete panels custom fabricated in Finland in an Indigo color. Looking up at the southwest corner. Close-up of the north facade. The tower will offer three penthouses, with the topmost two units spanning a full floor and featuring the tower's signature double-height loggia terraces. Penthouse view south to Lower Manhattan. Penthouse view west towards Chelsea and Hudson Yards. Penthouse view north towards Midtown. View south from a double-height loggia. Southwest corner of a double-height loggia. Architect: Rafael Vinoly Architects; Interiors: Jeffrey Beers International; Developers: Victor Group, Lend Lease; Program: Residential, Retail; Location: NoMad, New York, NY; Completion: 2019.